They’re eye catching, they’re innovative, and they’re intriguing. They’re called Point of Sale (POS) or Point of Purchase (POP) displays, and they are on the rise. POS displays are created daily to grab consumer attention and influence their buying habits. Many people are familiar with this concept, but most aren’t aware of the revenue these displays can bring into convenience stores, grocery stores, and gas stations – especially during the holidays. So, we decided to unveil some insights and statistics on holiday displays, sales, and POS displays. Food, beverage, and alcohol sales are known to experience a large increase during the holidays. There are likely many reasons for this rise in the market; there is an increase of social gatherings, consumers have more money as they’ve been saving for this time of year, there are limited-time offers that consumer’s can’t pass up, and there are incredible POS holiday displays that reel consumers in and help make a sale. Since consumers enjoy this time of year to treat themselves and others, it’s fun to get in the spirit with them and create a few POS displays. Designing and creating a POS holiday display is often a successful tool in closing a sale. POS displays are influential because they attract consumers with their look and visionary style. They can be as simple as table-top pieces showcasing smaller items near the register to eye-catching floor models that grab the attention from far and near. Often times POS displays also showcase a promotion, rebate, or limited-time offer. Holiday POS displays are very POSular for advertising new or limited holiday flavors of food and beverages. This sales method is repeatedly profitable for impulse buying, as 70%-75% of consumer decisions are made while shopping. Utilizing displays is an easier way to feature a product and brand that will not only sell to consumers, but will increase the likelihood that brand will stick with them. 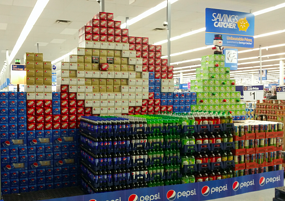 POS holiday displays are widely used throughout the world and in a variety of markets. They have been proven to be effective and successful time and time again. There are many different ways to create and showcase a POS display, but some show better stats than others. In a study conducted by the Advertising Research Foundation, they found that simple POS displays increased sales 12%-27%. An inflatable or mobile POS display increased sales of products, on average, by 40%. They also found that if the POS display was promoting a POSular movie, holiday, or other, the sales increased over 65%. POS displays are proven successful. Your store could benefit greatly by incorporating one this holiday season. The best part? Bernick’s team members have years of experience creating and building POS displays. We enjoy the challenge of creating something original, and placing something in your store that will not only get everyone talking, but will bring in extra revenue to your business.